KAHNAWAKE, QC – CBC News reports that a new brewery in Quebec has made history by being the first in the province to open on a First Nations reserve. 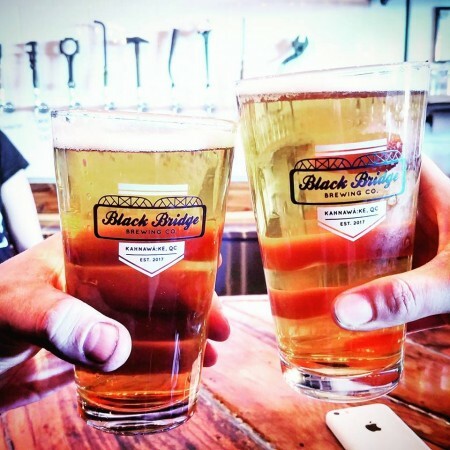 Black Bridge Brewing is located in Kahnawake, a Mohawk Territory on the shore of the St. Lawrence River south of Montreal. Open since mid-March, the brewery takes its name from a nickname of the Saint-Laurent Railway Bridge, which was built by a team that included many Mohawk metal workers. Beers available in glasses and growlers at Black Bridge – which is unrelated to the similarly named Saskatchewan brewery – include Black Bridge Blonde (4.6% abv), Goose Neck Belgian Wit (5.4% abv), Hard Day’s Work ESB (5% abv), Bull Pin American Pale Ale (5% abv), Bammer Stout (4.7% abv), 3 Hops This Time IPA (6.6% abv), Good Old Days Double IPA (8.5% abv), and Nail Bender English Brown (4% abv). For more details, see the Black Bridge Brewing Facebook page, and the full CBC News article.